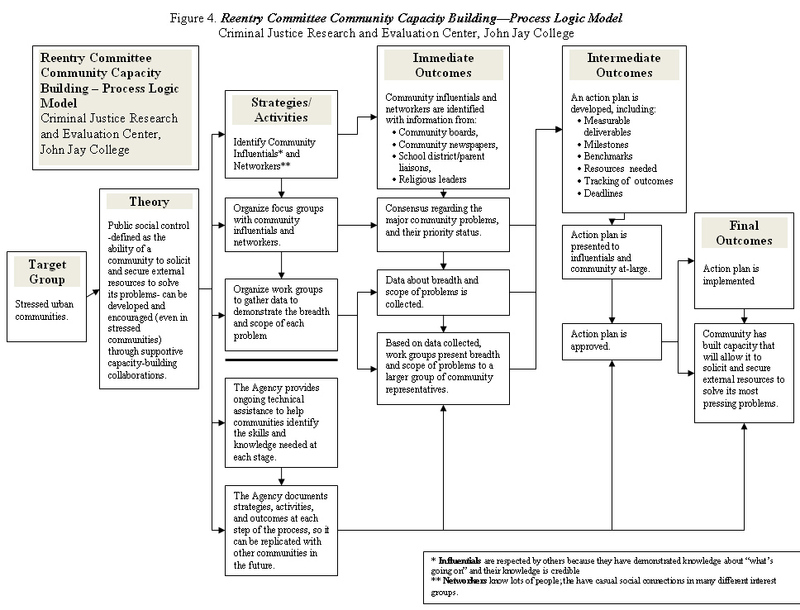 A theory of change model, often referred to as a logic model, is one of the most common tools used to map out your specific community's approach. The flow of the theory of change model begins with identifying the target population and ends with long-term outcomes. We've listed the headings most often used for each column. 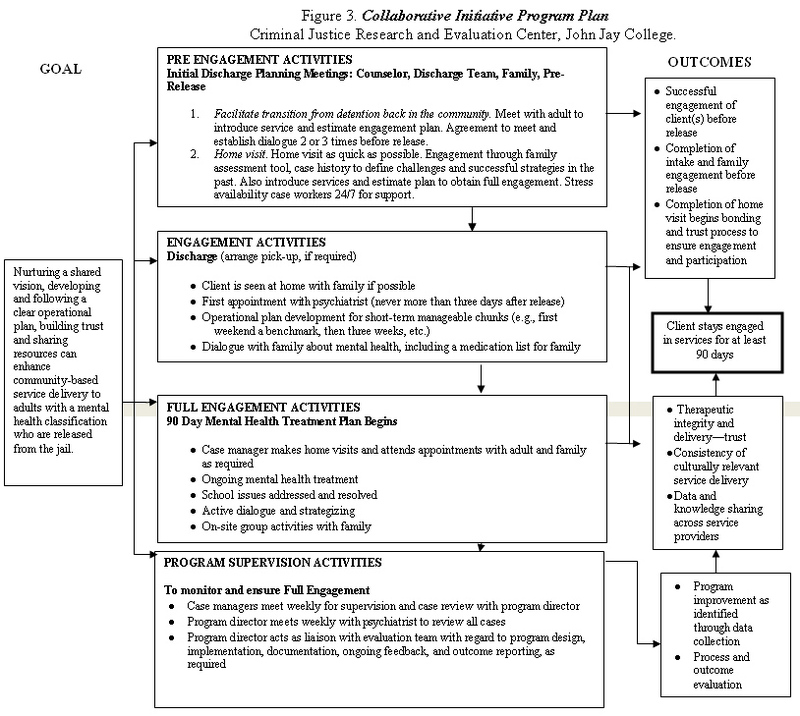 Developing a theory of change model is a group activity; it requires input from multiple stakeholders central to your community's TJC initiative. Crafting a theory of change model begins by convening key stakeholders from the community and the jail to discuss and define the initiative's goals and objectives, and the interventions or activities your community views as essential to achieving these goals and objectives. As discussed in module 4, a data-driven understanding of local reentry issues should inform many of these early discussions. Below, we have provided several examples of theory of change models, focusing on transitioning people back to the community, provided by the Criminal Justice Research and Evaluation Center at John Jay College. Criminal Justice Research and Evaluation Center, John Jay College. Performance measures determine the type of data you must collect to measure your short, intermediate, and long-term outcomes and are thus directly connected to your theory of change model. Reports of these data and outcomes should be readily available to assist decision makers in resource allocation and implementation strategy. If you don't measure results, you cannot tell success from failure. If you can't see success, you can't learn from it. Paying for performance: Use performance measures as a basis to determine and reward effectiveness. The New York City Department of Corrections, for example, employs performance-based contracts with its transitional service providers. Service providers bill the NYC DOC for individual clients, and the billing structure relies on a pay scale that ties increased fee amounts with continued client involvement. Performance-based contracts provide strong incentives for service providers to be aggressive in their efforts to maintain client engagement. Managing for Performance: Use performance measures to improve outcomes through the following steps: identify problems, analyze them, locate the root cause, and develop and implement the solution. Budgeting for Results: Use performance measures and information to allocate resources. As table 1 indicates, results-based budgeting is outcome driven, promoting ongoing evaluation and interagency collaboration. Begin by developing TJC performance measures for each of your theory of change model's short-term, intermediate, and long-term outcomes. This needs to be done before you develop your data collection plan to make sure your strategy for collecting data supports each performance measure used in your self-evaluation. There must be a clear and compelling link between your initiative's objectives, outcomes, performance measures, and indicators, and the data you plan to regularly collect and analyze. Many people believe that rearrest, reconviction, and reincarceration rates are the only ways to measure successful transition strategies. Although long-term public safety is paramount, there are other important process and system outcomes to measure to enhance public safety and efficiency. The menu of TJC performance measures located at the end of this module offers several indicators (actual measures) for each above measure. The process measures, although difficult to track, should be a priority for each jurisdiction as they will allow progress to be monitored on an ongoing basis. Depending on the agreed upon definitions (e.g., indicators selected, specified time frame for measurement), the public safety and reintegration measures can take a long time to demonstrate progress and success. 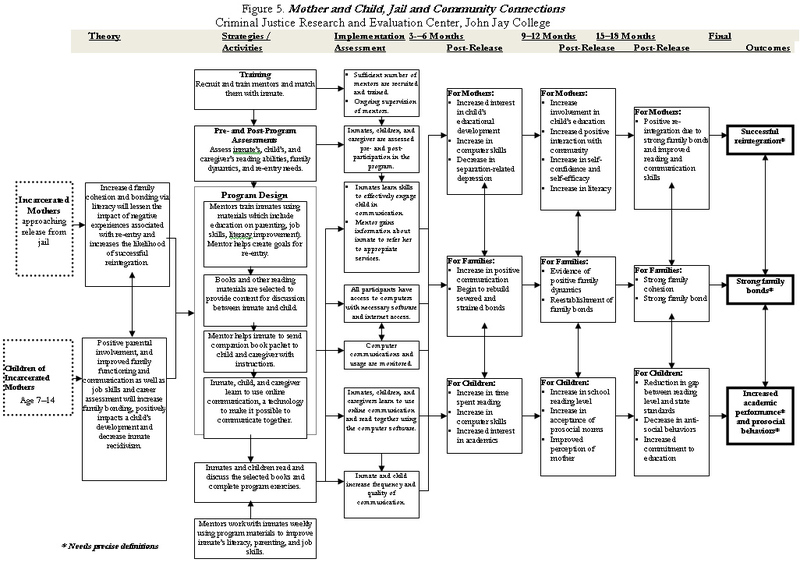 The process measures represent intermediate outcomes that should be monitored closely, keeping in mind that if the associated activities are targeted and implemented correctly, they should positively affect reintegration and public safety outcomes. 1 Rossman, Shelli B., and Laura Winterfield. 2009. Coaching Packet: Measuring the Impact of Reentry Efforts. Silver Spring, MD: The Center for Effective Public Policy, p. 8. 2 Osborne, David, and Ted Gaeble. 1992. Reinventing Government: How the Entrepreneurial Spirit Is Transforming the Public Sector. Reading, MA: Addison Wesley. This menu of system-level performance measures helps you identify those that are most important to your initiative. You may want to collect and review these data monthly to support internal monitoring but report on them quarterly to the broader stakeholder group to track outputs and short-term and intermediate outcomes. - Level of treatment enrollment (e.g., inpatient, outpatient). - Number or percentage in compliance with child-support obligations. While the TJC initiative does not require a fully developed or collaborative management information system (MIS) in place for self-evaluation or inter-agency information-sharing, your agency should have the basic protocols and capacity to collect and access information relevant to operations and outcomes. An MIS is needed to measure performance and program success along desired outcomes through an external evaluation and a self-evaluation. This system will allow for each community to determine the who, what, where, and when of targeted service delivery. Refer back to Module 4: Data-Driven Understanding of Local Reentryfor Step 2: Data Collection. 1. Burke, Peggy. B. 2008. 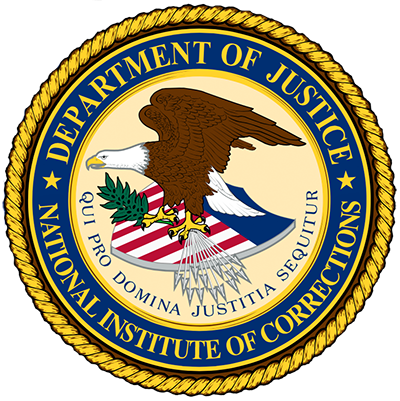 TPC Reentry Handbook: Implementing the NIC Transition from Prison to the Community Model. Chapter 6, “TPC Performance Measurement Framework." 2. Kent County, MI Sheriff’s Office. TJC mission-driven system-wide performance measures and outcomes. 3. Miami-Dade County, FL. 2008. Breaking the Cycle: Rehabilitation and Job Training in County Jails. Miami-Dade County Blue Ribbon Advisory Committee. A comprehensive report recommending initiatives to facilitate the reentry of inmates into the community and reduce recidivism. 4. Demographic characteristics the Montgomery County, Maryland, Correctional Facility uses to understand more fully the needs of its population. 5. University of Wisconsin Cooperative Extension. 2002. 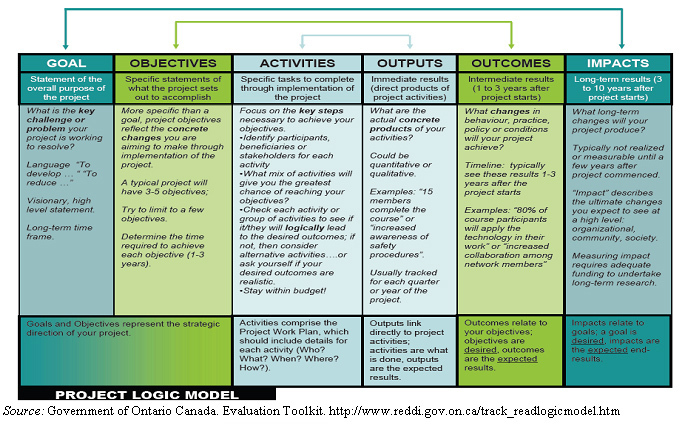 Enhancing Program Performance with Logic Models. 6. Urban Institute. TJC Performance Management Worksheet: Core. A detailed chart of TJC baseline measures of jail inmate population characteristics in Excel format and a memo providing guidance to assemble the initial TJC performance indicators. 7. Urban Institute. 2009. 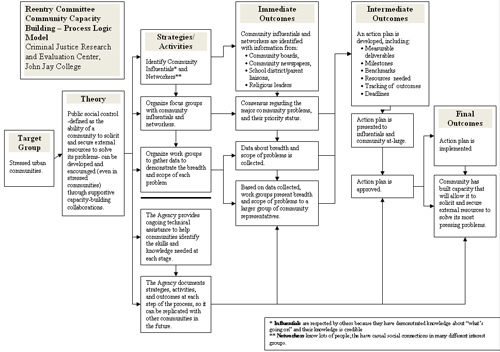 TJC Initiative Theory of Change Model. Brief explaining Theory of Change models. 8. W.K. Kellogg Foundation. 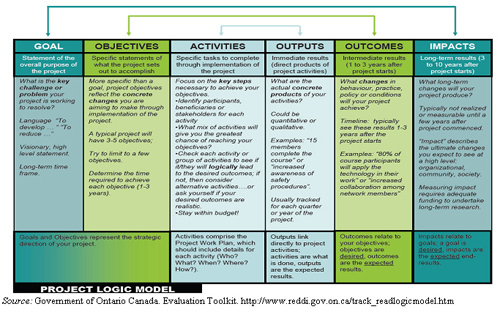 Logic Model Development Guide. The purpose of the program and its overall objectives. A list of activities used for other programs that are out of budget range. The expected outcomes that you have determined your program will achieve. Long-term impacts that describe the ultimate changes expected. 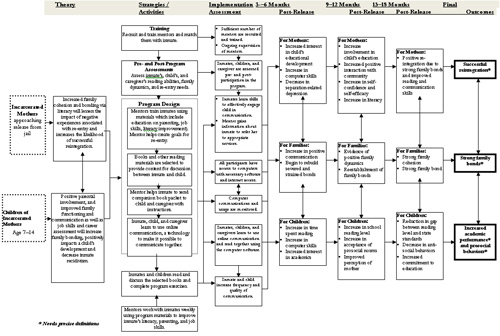 Now that you have completed this section, you understand that by developing a theory of change model and using performance measures to determine the success of your outcomes, you can demonstrate that your program is based upon a specific theory, has clear goals and objectives, and that if a comprehensive process is followed, you are likely to see measurable program successes and failures from start to finish.